The Toro Power Clear 221 Q Snow Blower is one of Toro’s more powerful snow throwers. It’s bigger and stronger than other similar models like the Toro Power Clear 180 snow blower or the Toro 210 snowblower, but it’s still predominantly used by home owners. The Toro 221Q is self propelled which is a godsend to anyone who has previously owned a snowblower that needed to be pushed. The 221Q snowblower’s auger is acutally what propels the machine forward, not the wheels! It is just touching the ground and is obviously spinning, so every time it touches the ground it propels the machine slightly more forward. Thanks to it’s Toro made R*Tek 0.14 liter motor, the Toro Power Clear 221Q is capable of throwing up to 771 kg (1700 lbs) of snow every minute. So if there has been a heavy snowfall the previous evening, this machine will almost always take care of it. It has a 0.53 m (21 inch) clearing width which is more than adequate for most home owners. It’s rubber Power Curve auger rotor that helps to drive the machine forward can handle depths of snow up to 0.32 m (12.5 inches) deep. The square deflector chute is constructed from plastic and can rotate up to 180 degrees so that the operator can always find the optimum throwing angle. The whole machine weighs in at either 33.6 kg (74 lbs) or 34.5 kg (76 lbs) depending on whether or nor you purchase the recoil starting version or the electronic starting version of the Toro 221Q Power Clear snowblower. Most operators find that it’s 1 liter fuel tank holds enough gasoline to allow the machine operate for well over an hour before it needs to be refilled. Like all Toro snow blowers, the Toro 221Q comes with a 2 year guarantee, as Toro are so sure of their machine. It also has a 2 year starting guarantee. 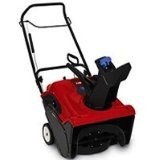 Click Here to but the Toro Power Clear 221Q Snow Blower.